My street in the Plateau Mont-Royal is being dug up again. It’s the fifth time that this particular intersection has been dug up in the past three years. Or maybe it’s the sixth. In all honesty, I’ve lost count. The area has been under construction so constantly since I moved there in 2011 that I’ve taken it as the default for the area. Residents have gotten fed up, with endless road closures, random power and water shutoffs with no warning, and constant noise and dust from the ongoing construction. With all this construction, not once have I or other residents ever received any kind of notice. Local businesses have closed in droves. My neighbourhood is a shell of its former self. Each time the road is filled back in and the construction crews remove the barriers and orange cones and clear out, I don’t even dare to hope that it’s really, truly, over. By now, I know better. Anyway, back to the traffic lights. This begs the question of why they couldn’t installed the last time the road was dug up to widen the sidewalks. Or the time before that, to fix the broken water main. Or the time before that, to replace the pipes. Or the time before that, to tear down an abandoned building and put up condos. Or the time before that, to … well, who even remembers anymore? And so on, and so forth. So this morning, I was leaving for work, trying to navigate around the construction as usual. Today was worse than usual, since even the pedestrian access was cut off. The construction worker out front of my apartment suggested that I ‘detour’ completely in the opposite direction of where I was going — doubling my 10-minute walk to a 20-minute walk. 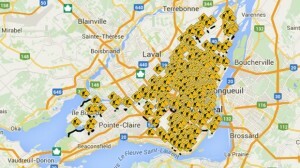 And that, in a nutshell, sums up everything that’s wrong with the way we do construction in Montreal. The city doesn’t talk to the borough. The borough doesn’t talk to the city. The water department doesn’t talk to the electrical department, which doesn’t talk to the road paving department, which doesn’t talk to the pothole fixing department, which doesn’t talk to the traffic light department. In one particularly egregious example, a city beautification crew came through and planted flowers along the median in the morning, only to have all their work dug up by another city crew in preparation for roadwork that very same afternoon. I’m not making this up. I wish I were. Montreal has become so known for its endless construction, in fact, that Josh Freed has (semi-jokingly) proposed that we make the orange cone the official city symbol. At least one retailer, Main and Local, has taken him up on the idea. 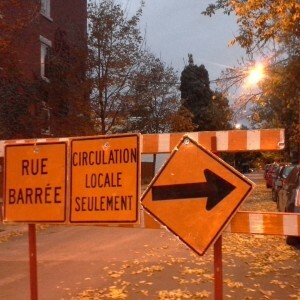 The usual excuses all take the same form: Montreal is an old city with ageing infrastructure in urgent need of repair. Years of neglect have caused us to fall behind on these repairs, and we have to spend a lot of money making up for it. And yet, much older cities seem to manage just fine with far fewer construction nightmares. I’m sure most of Europe would laugh at the idea that Montreal is an “old” city. And yet, they manage to maintain and repair their centuries-old infrastructure with a minimum of headaches. Look, with a little bit of planning, we could blitz construction projects each year. Start one tenth the number of projects at a time, put crews on them to run them efficiently, manage the power and water and bike lanes and traffic lights and paving all together, finish them up within a couple of weeks, and move on to the next. There’s absolutely no reason whatsoever to launch hundreds of construction sites simultaneously, and close every single autoroute, road, bridge, sidewalk and intersection at the same time and allow those projects to drag on for months and years. No other city in the world does construction this way. They all think we’re insane. Conspiracy theories abound as to why it happens this way in Montreal. The construction industry is controlled at least in part by organized crime. The construction companies are colluding. The politicians are taking kickbacks. And so on, and so forth. Most of those things are true, at least to some degree — just read the transcripts of the Charbonneau Commission if you’re not convinced. And there’s no easy way to stamp that out overnight. But I’m also a proponent of the theory that you should never attribute to malice what can be chalked up to mere incompetence. And let’s face it: The level of incompetence in how construction is planned in this city is staggering. Mayor Denis Coderre doesn’t seem too inclined to do anything about it, either. He flits around the city taking selfies and planning big vanity projects for Montreal’s 375th anniversary. 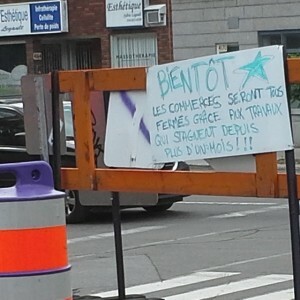 Meanwhile, the official opposition Projet Montreal seems more concerned with punishing car owners and local businesses by closing more roads, adding more construction projects, and making it harder for anyone to live or work or visit the city — and the complains when businesses move out to suburban multiplexes like Dix-30. And so, the orange cones aren’t going anywhere anytime soon. This problem affects all of us.